Since moving in together last May, Christian and I have been trying to be a little adventurous with what we cook. We do still have days where all we have is hot dogs or burgers or frozen pizza but cooking together is something we enjoy doing. Here are some of the meals we've cooked and the recipes if we used one. 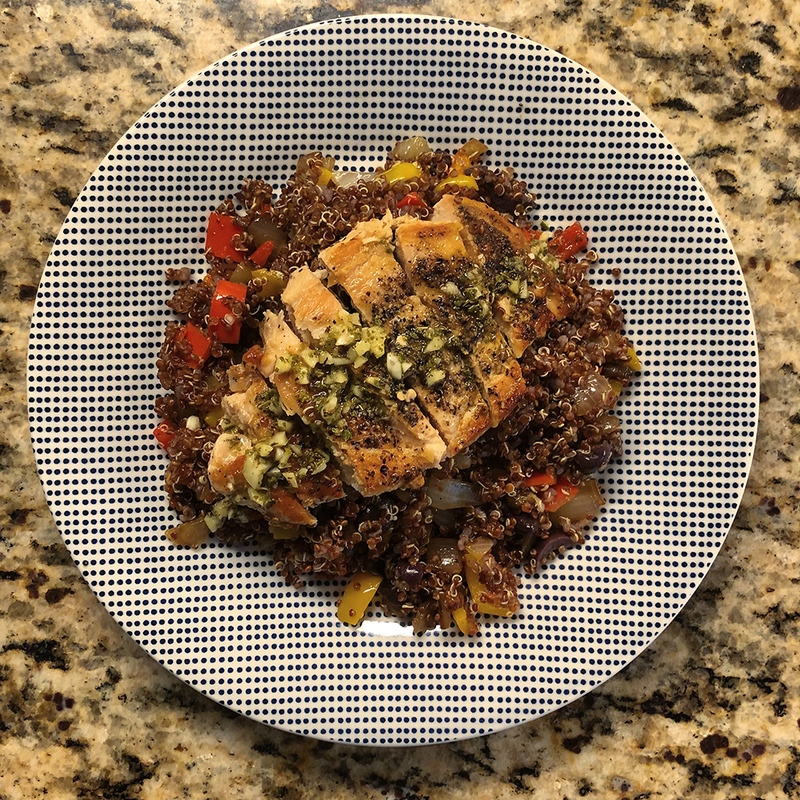 One of the first weeks in our new house we did a free week of Blue Apron so we made 3 delicious meals! 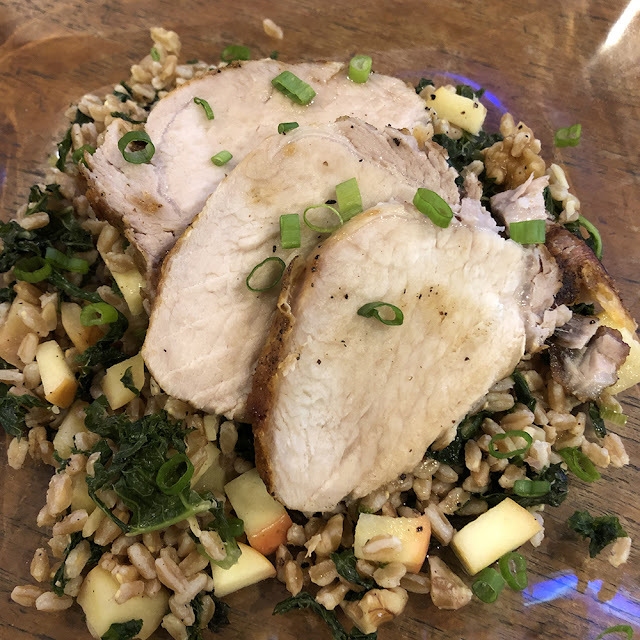 The rest of the time we've either looked up past Blue Apron recipes to make, checked out food blogs, like Budget Bytes, or experimented with what we had in the house. I have a pinterest board that I load up with recipes and I save recipes on the Blue Apron app that I want to try. We eat a LOT of chicken so we try to do it different ways. P.S. 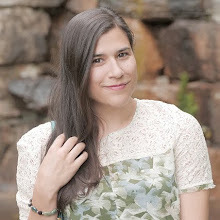 Would you want to see actual cooking posts on the blog in the future? I'm trying to expand my blog content and it seems to do well on my Instagram stories. This was one of the first Blue Apron meals I made years ago and remains one of my favorites so we remade it over the Summer. I'm not normally a tomato person but this side dish is amazing! This meal also gets me to eat zucchini, another vegetable I'm not horribly fond of. Blackened chicken, however, is always a Megan pleaser. 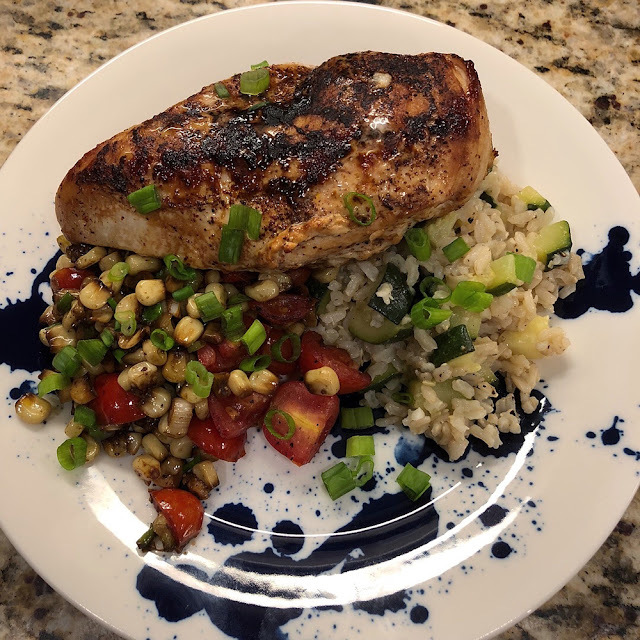 One of our "real" Blue Apron meals and it was great. I'm a notoriously picky eater but they continually get me to try new things. Peppers are on my "don't like" list yet they were delicious in this meal so now I'm more open to eating peppers in food. Separating this from the regular chicken and rice meals below because it's extra special! It took us -meaning Christian - a few tries to perfect frying chicken in a pan but we found the perfect method. It takes patience and an infrared thermometer. Temperature control is the key here, and using an IR thermometer is especially handy when working with Pan Fried chicken. The goal was to stay between 300° - 325° until both sides were browned and cooked through (165°). This was the best homemade fried chicken I've ever had and now I'm craving it again. We got a casserole/dutch oven for Christmas so maybe we'll attempt some deep frying next week! Another Blue Apron recipe we looked up when we had some random ingredients to use up. 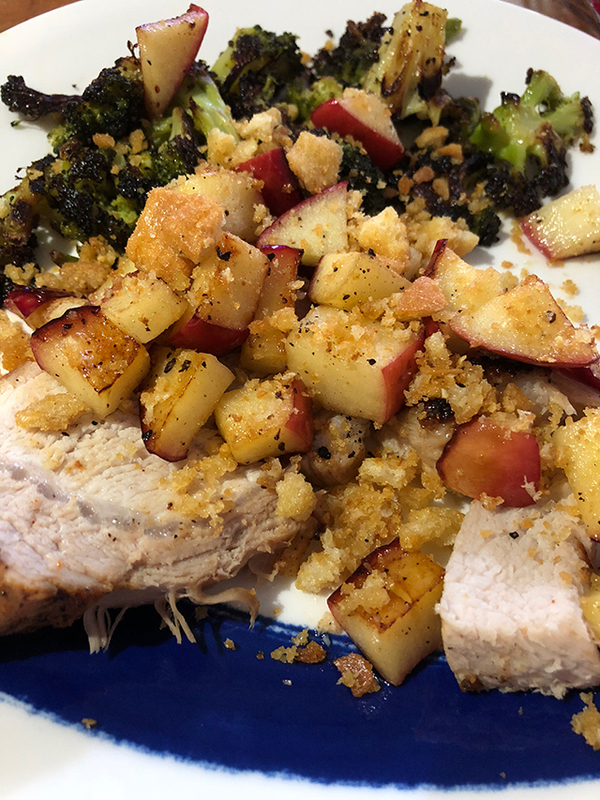 The garlic breadcrumbs, apple and pork were the perfect combination!Finishing it off with our staple vegetable made for a really simple, tasty meal! Made when my friend Hayley came to see our house. 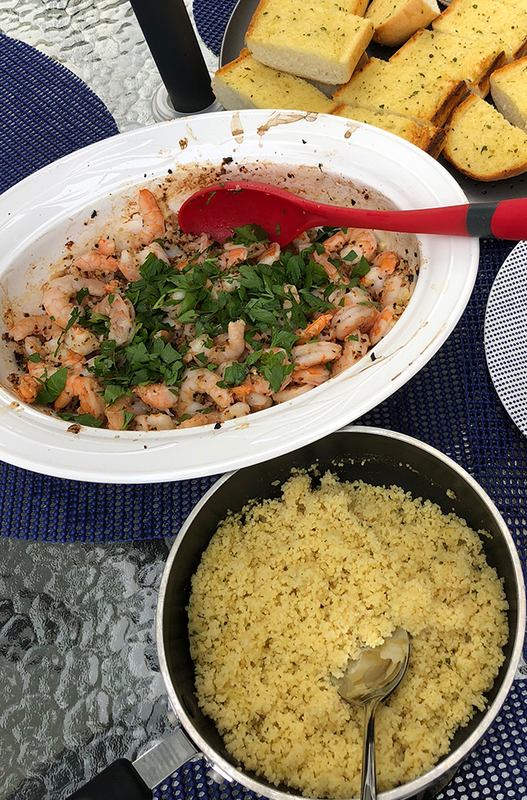 I had seen this garlic shrimp recipe in one of those Facebook foodie videos and immediately made a note to try it some time. You can't fully see the breadcrumbs here but let me tell you, they add the perfect amount of crunch. We devoured this whole thing of shrimp in minutes. The couscous is just Near East brand garlic & herb. In the Summer and Fall the next town over (where I grew up) has a weekly farmers market. Every once in a while we'll treat ourselves to a DELICIOUS pesto from one of the stands. It's $8 but oh so worth it! We actually have one in the freezer for when crave it during the Winter. One of my favorite things to do with pesto is put it on pizza. 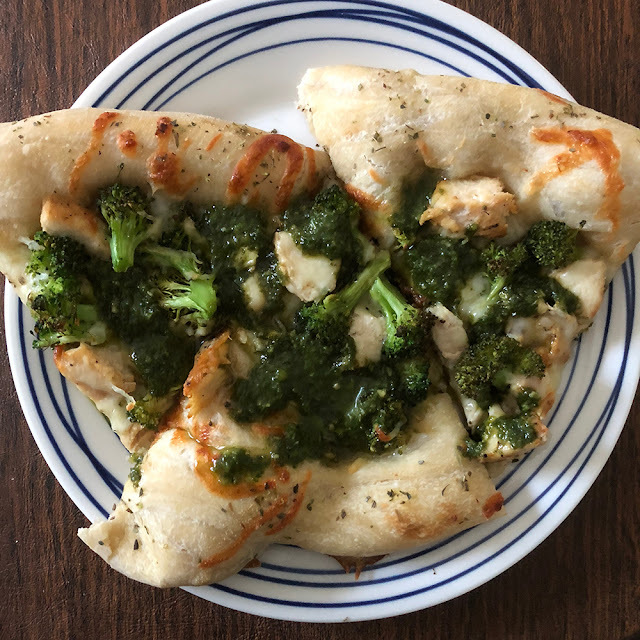 More specifically chicken and brocolli pizza! Soooo good! It's also amazing on its own with bread. 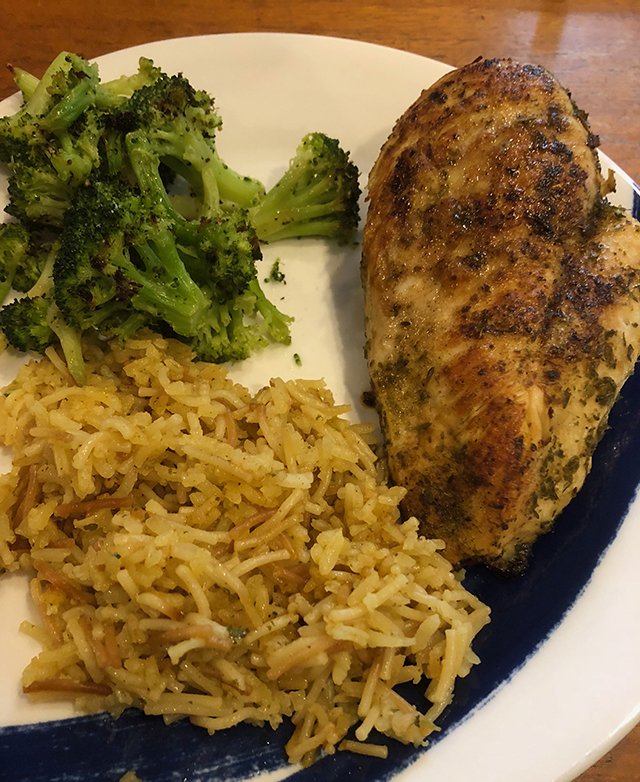 One of our staples is chicken and rice-a-roni, usually with roasted broccoli as a side. It's what we cook when we want something "real" but don't want to think too much about it. 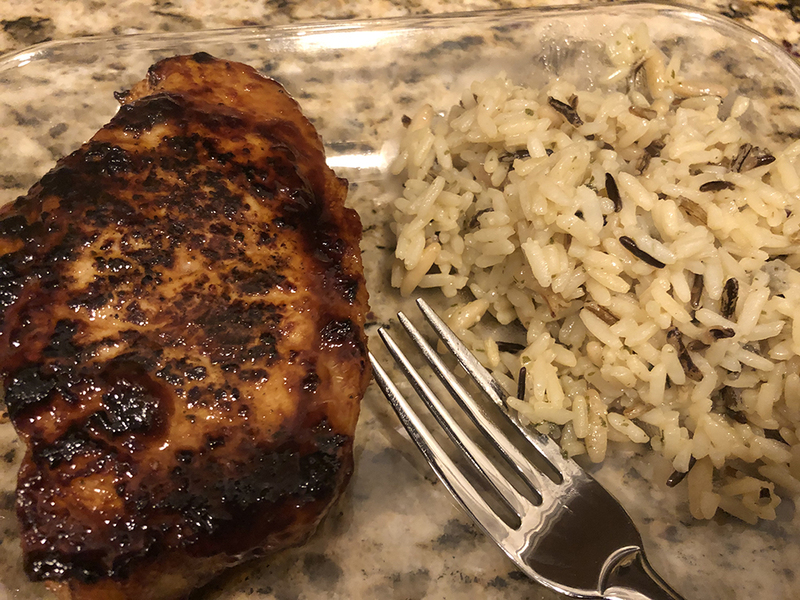 We grab a spice blend or make one of our own and cook the chicken in a skillet. Then we cut up some garlic (or use garlic powder if we don't have garlic) and roast broccoli until it starts to get blackened. SO GOOD. Next comes the Rice-a-Roni. Most people just cook up the rice-a-roni using the box instructions. I add something a bit more special when we make regular chicken rice-a-roni. But it wasn't something I figured out on my own. Whenever I go to my Aunt & Uncles my Uncle makes my favorite meal - chicken and rice-a-roni. He has a magical way of spicing up chicken that I have yet to recreate and he does the same thing with the rice. We brown the rice in the pan with butter first (as the box says) then when adding in the water and flavor packet we add something extra. MORE SPICES! I'm not sure what my uncle uses exactly but his rice is always superior to mine. Usually I add cajun seasoning, chilli powder, garlic powder, and any other spices I'm in the mood for. My brother's girlfriend got us an Instant Pot for our wedding and my brother suggested we make this as our first meal. It is a "throw everything in" and set it to go recipe which I love! All it is is chicken, corn, black beans, salsa and rice! We made this again last week and it was just as good. 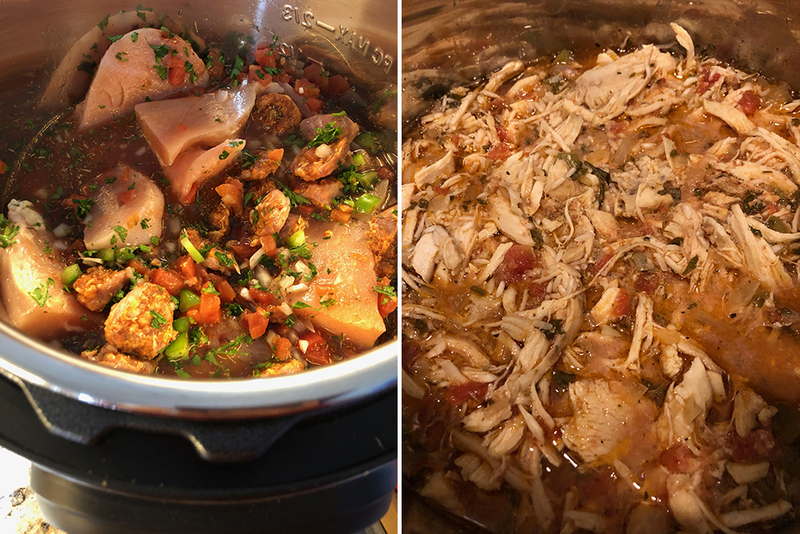 This week we're going to try the Slow Cooker Carnitas! Christian and I love to make stromboli because it's like a personal pizza but more fun! I'm not a huge cheese fan so I only add enough cheese to help my rolls stick together but Christian gets to load his up with a lot of cheese! 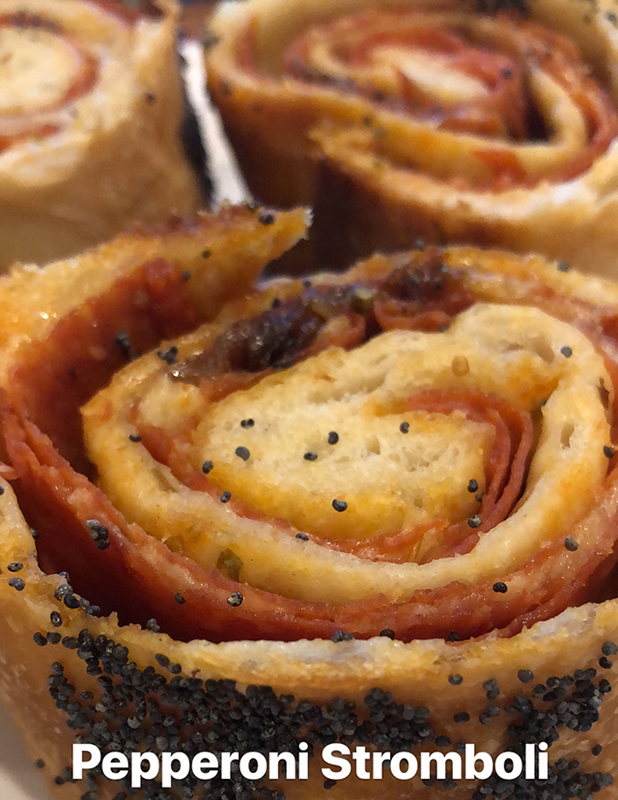 We had some extra onion lying around when we made this particular stromboli so we caramelized it and added it in! I also add poppy seeds to the top of mine where Christian likes garlic salt and Italian seasoning. 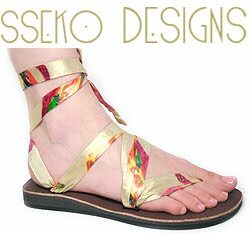 Customizable, quick and easy! Rice bowls are another easy meal when you just have things to use up. 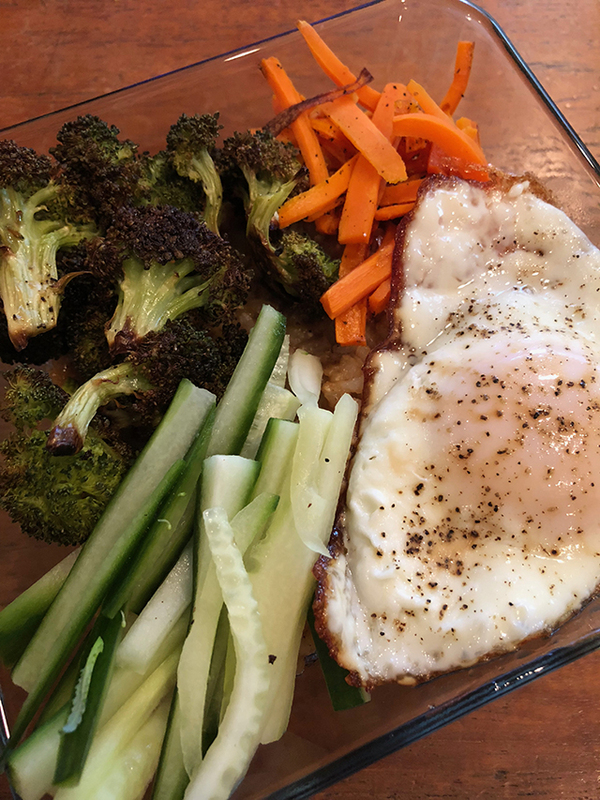 For this bowl we had brown rice added some soy and other ingredients for a sauce (can't remember exactly what) and topped with broccoli, carrots, cucumber and a fried egg. 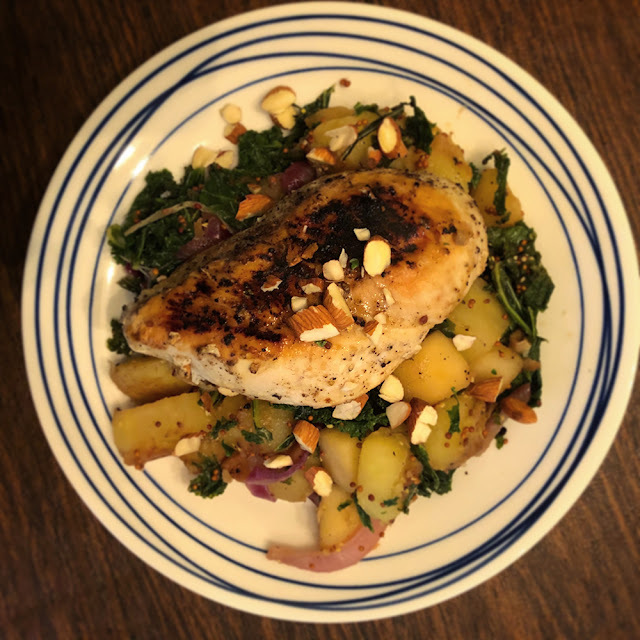 A Blue Apron recreation we made when we had some leftover potatoes and an apple in the house. We did have to go out and get the mustard, almonds, red onion and kale though, ha ha. A thrown together meal when we weren't sure what to have. 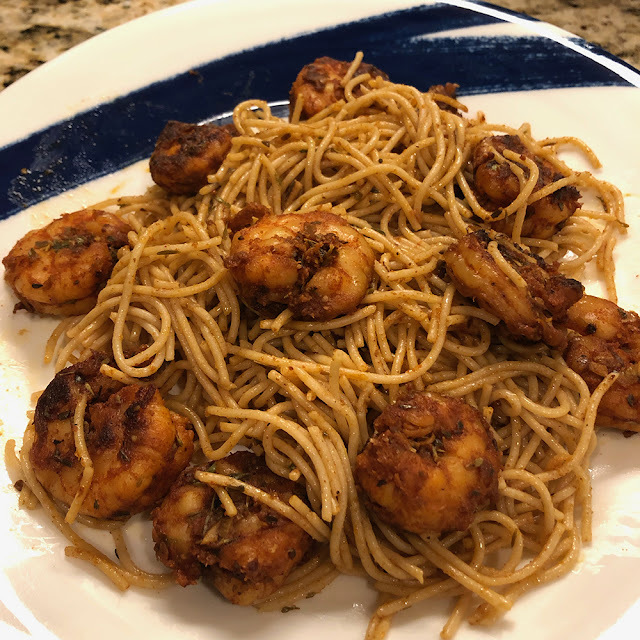 I found a cajun spice blend recipe and we added it to shrimp, cooked them up and served over whole wheat spaghetti. 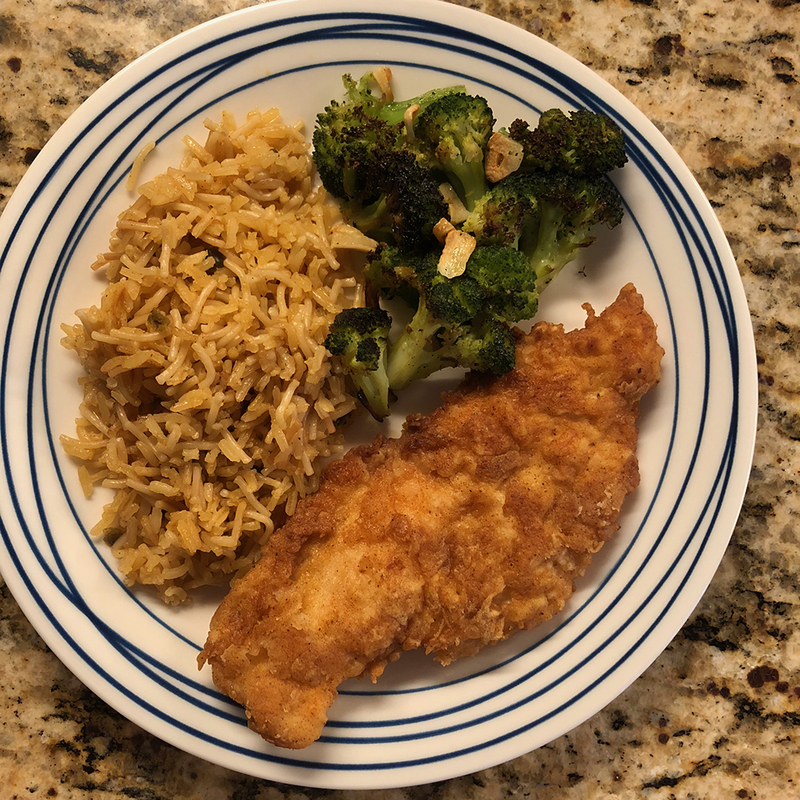 A second real Blue Apron meal, simple but still tasty. We may make this again in the future but would probably use it as a side dish for chicken or something. 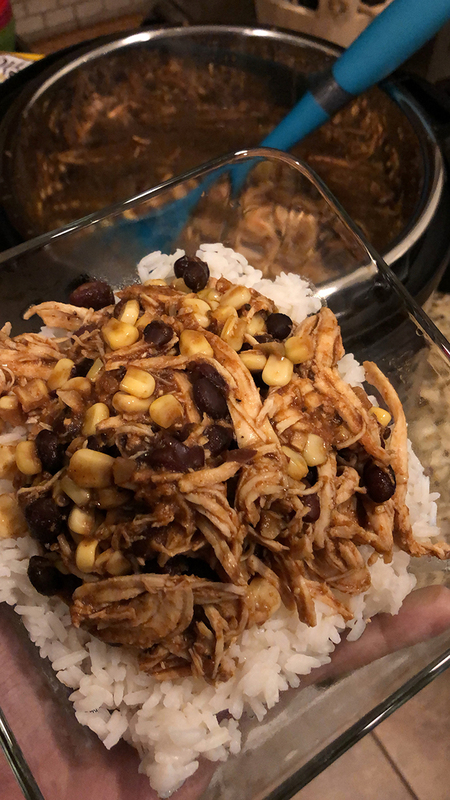 Another slow cooker meal from budget bytes! We had some sausage that we got on sale (buy 1 get 2 free) so we looked for a recipe we could make with it. 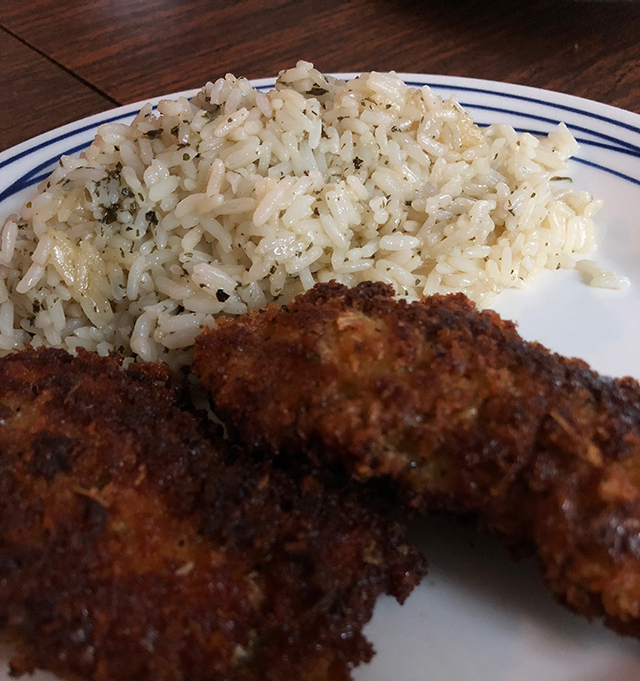 We had some difficulty with this one when the rice didn't cook all the way so it took us WAY longer to make than the site says. If we make it again we might par-cook the rice before adding it to the slow cooker. Yum, these all look like such tasty meals! 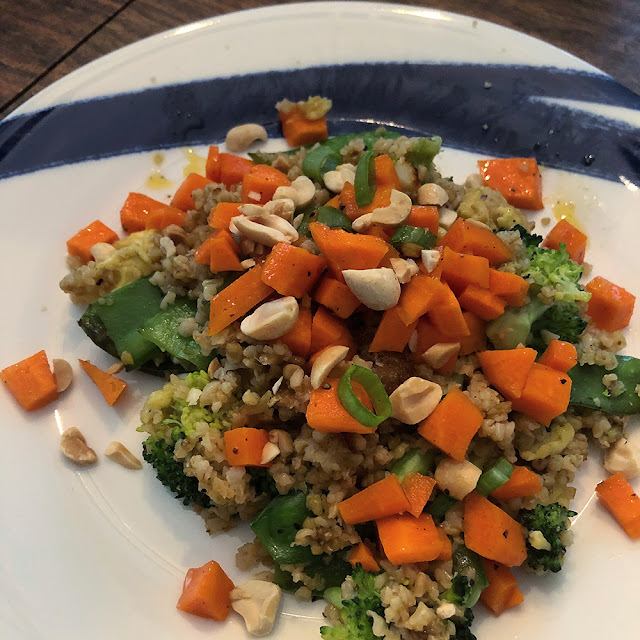 I tend to fall back on a few simple options I roll out, some things I like and then lots of fail-safe ones the boys will eat, which are all very simple, haha! I'm always looking for something new to cook, so I like seeing your dinners. The fried chicken does look like perfection, and you are so smart to use a thermometer to monitor the pan. Yummy!!! Everything looks so delicious. Oh I love Blue Apron! My ex and I had so much fun making meals together. Really great recipes with unique flavors. 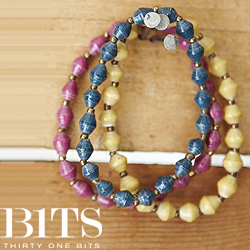 Really great for foodies! All your pictures make me hungry! All of these recipes sound so good! Our goal this year is to cook at home more! These are all such creative recipes! I’ve heard a lot of positive things about Blue Apron—even if you don’t stay with the subscription, it ultimately helps inspire you to cook healthier foods. Thank you for sharing for all of your dishes! I am headed to the grocery store to make one of these dishes tonight!